SACRE COEUR, Que. – We left our little crooked cottage for good and embarked in the late afternoon on our most expensive day yet. We took the ferry from Riviere du Loup to Saint Simeon, then up to Tadousac, eating our way into the evening. They say a picture is worth a thousand words. This one cost us about $300. The ferry to Tadousac (I’m pretty sure Tadousac can be directly translated as “tourist trap.”). And then there was Jacques and Jim (speaking of a thousand words). Jacques owns the inn where we spent the night and Jim’s his sidekick. They had a good fire going on behind the house, so I grabbed a beer and my translator wife and off we went to join them. The men walked into the darkness with a wheelbarrow and a flashlight and returned a few minutes later with several oddly shaped hunks of wood, most of a small tree and a large, navy blue drawer. Their accents were so thick, I was only picking up every third or fourth word, but lots of smiles and enthusiastic head-nodding kept them happy and chatty. Then the magical properties of my Alexander Keith’s kicked in, I relaxed and my mind was able to decipher their joual. Jacques was talking about the bearskin in the main room. When Jacques Cartier arrived in the New World, he said, the aboriginals gave them bearskins, which probably saved their own skins during their first Canadian winters. Jacques’s bearskin is named Brigitte Bardot. Trevor loses a battle with Brigitte Bardot. When there was a lull in the conversation, I had Mel ask Jacques how the salmon were this season and he was off again, with Jim backing up every fish tale. 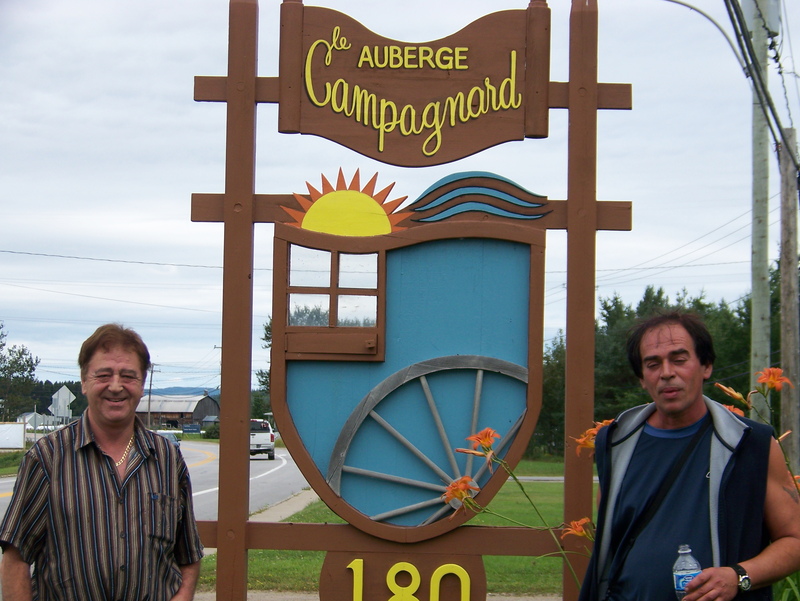 Jacques (left) and Jim, our fire friends.